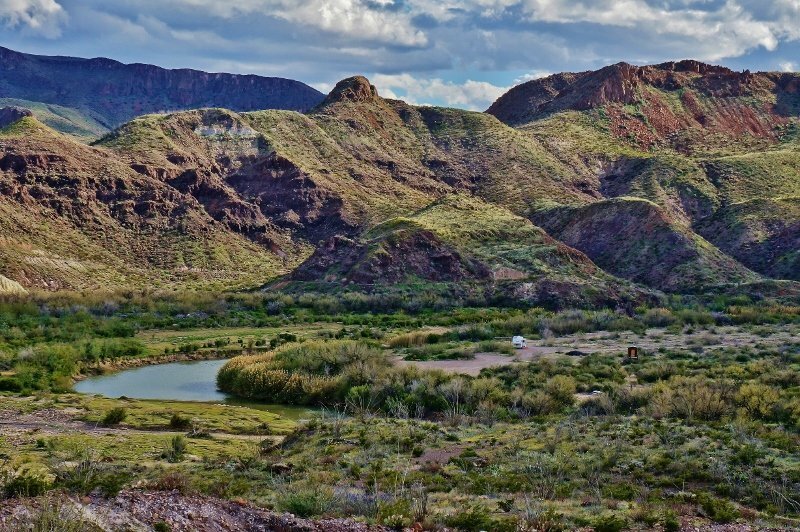 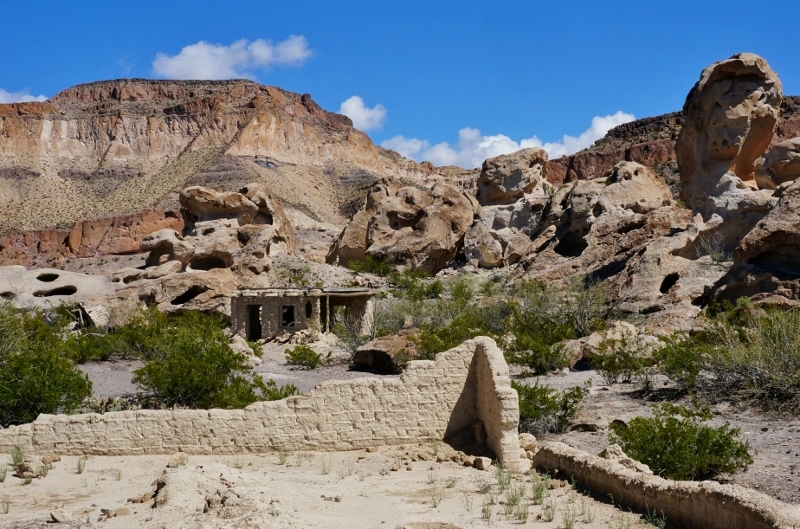 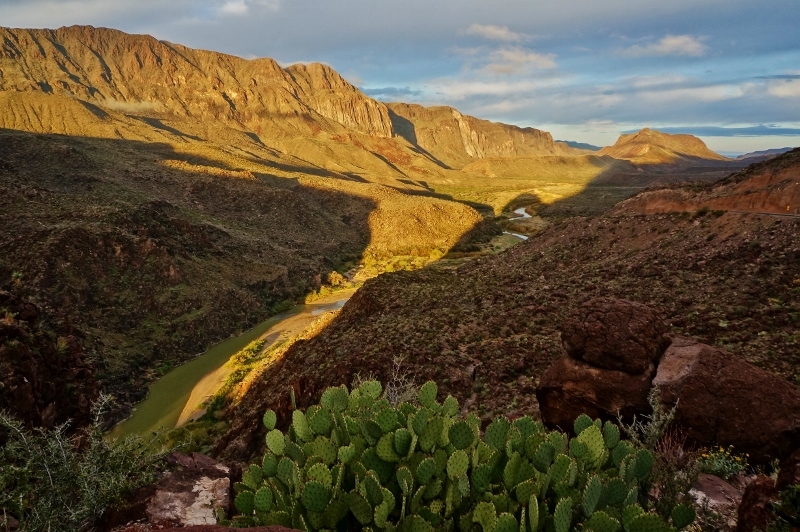 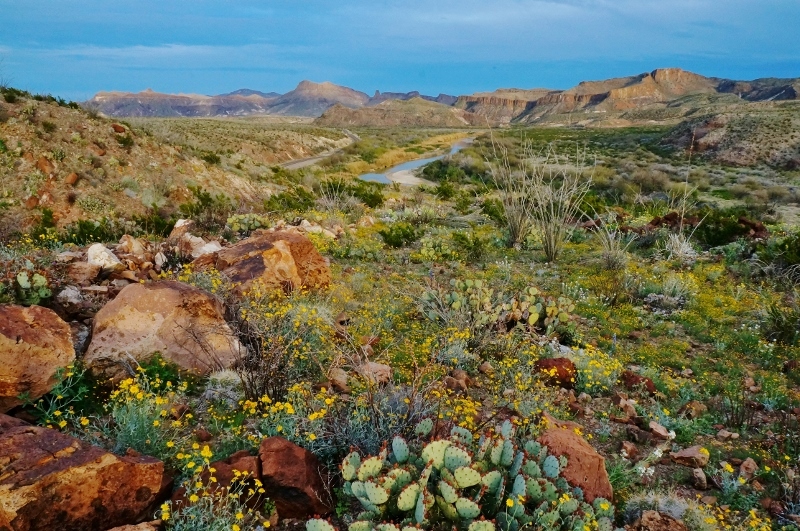 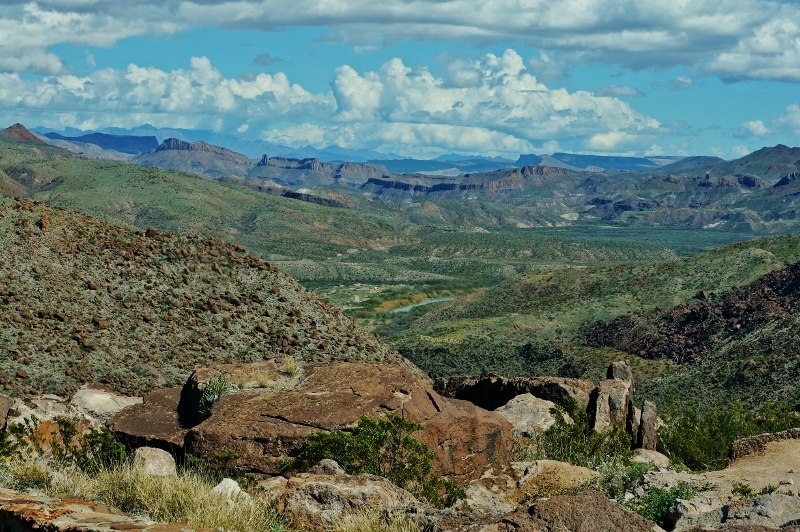 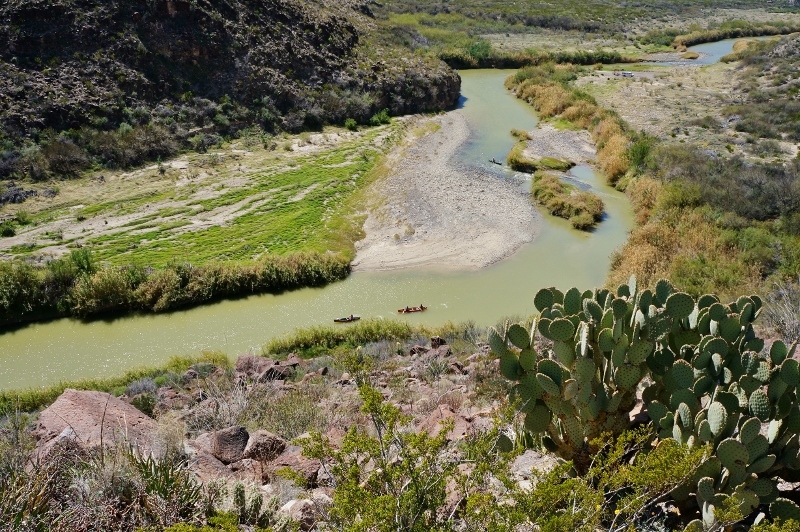 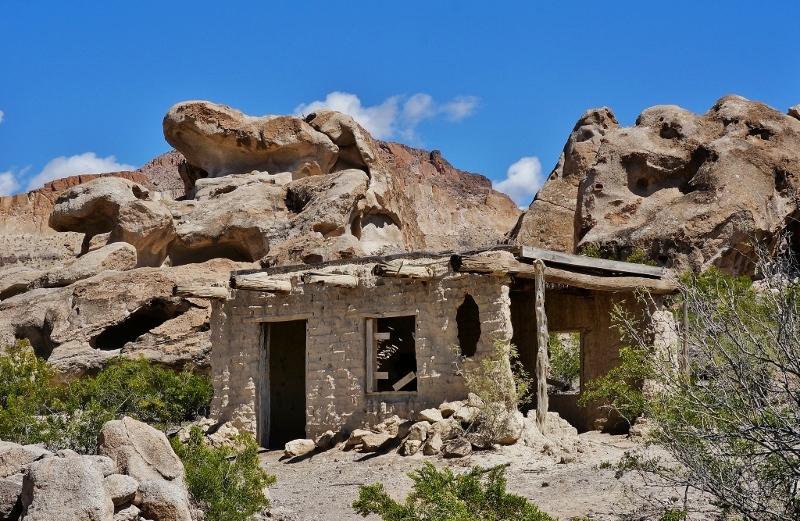 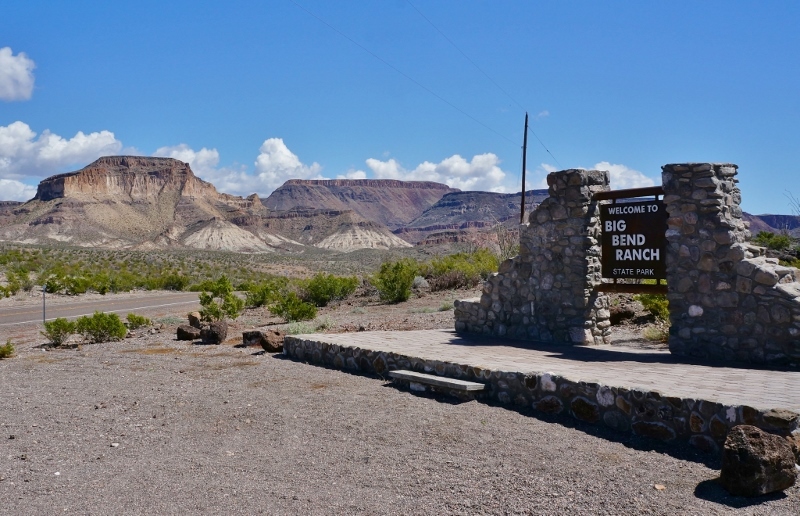 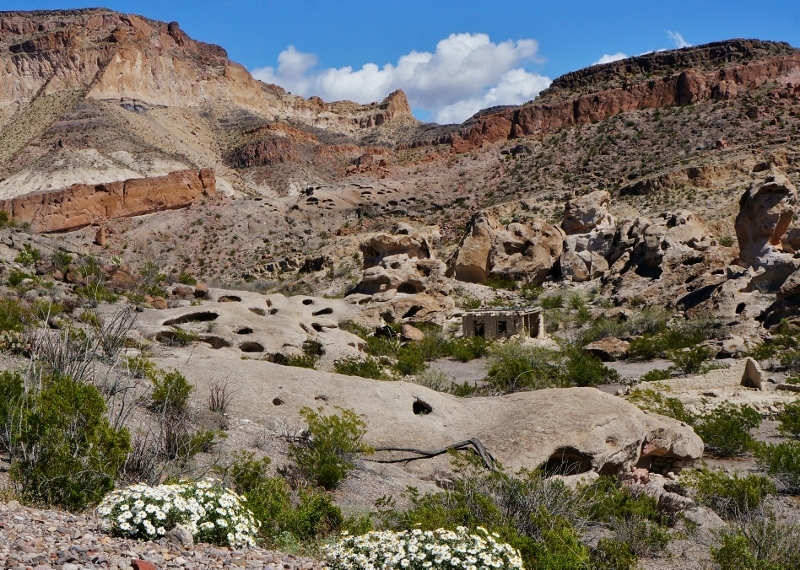 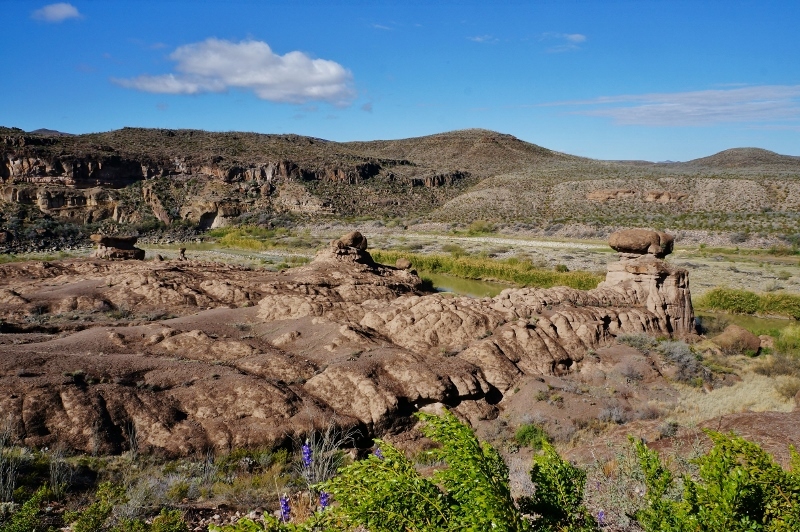 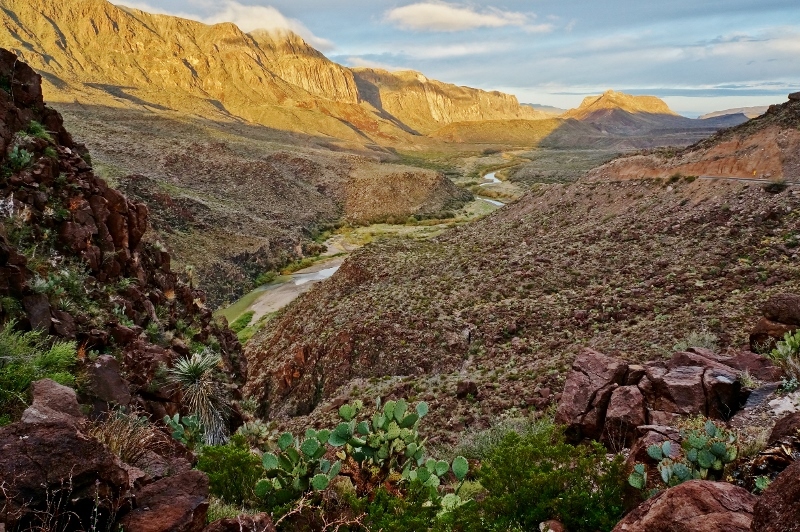 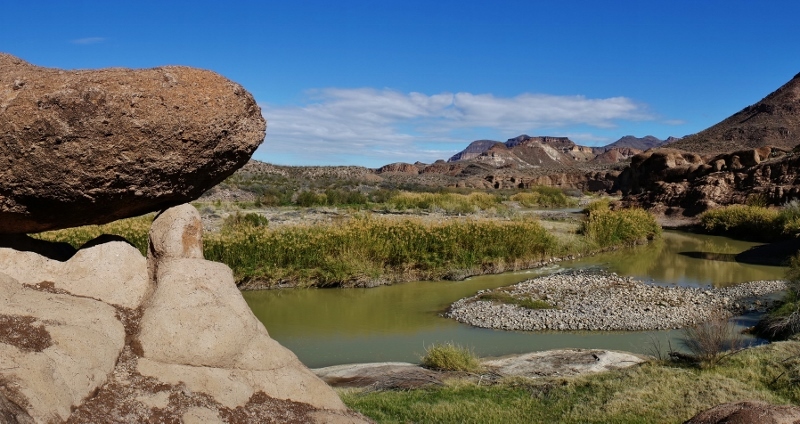 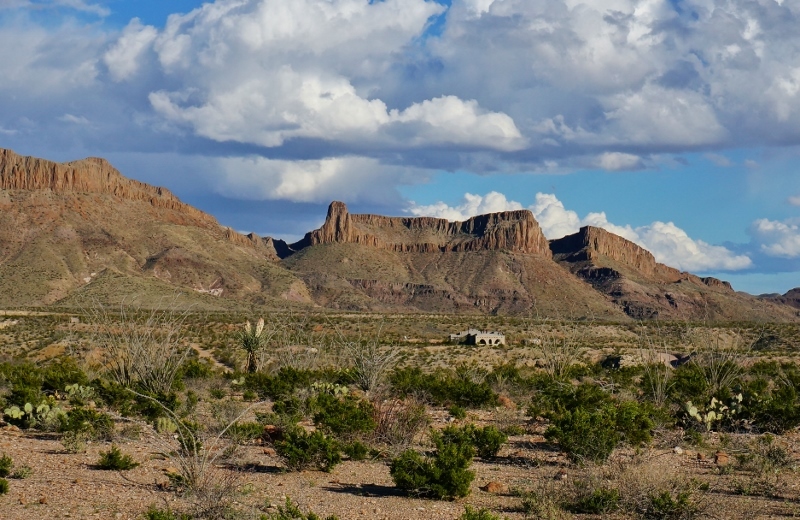 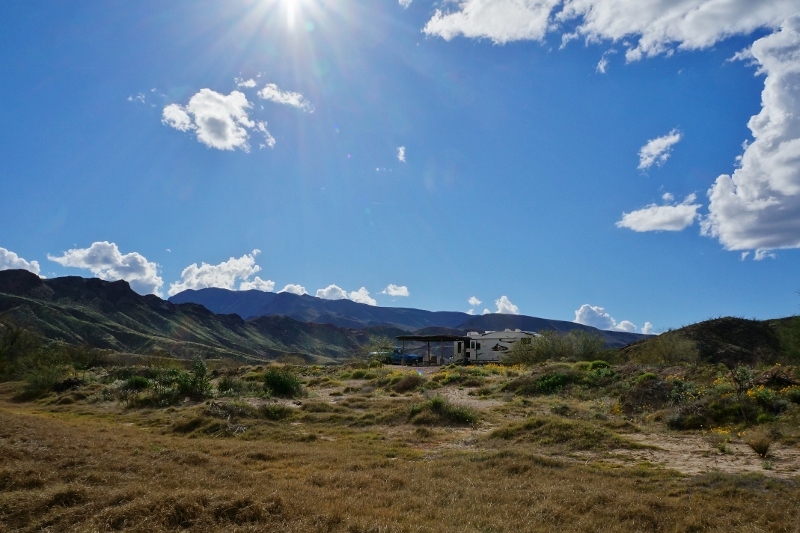 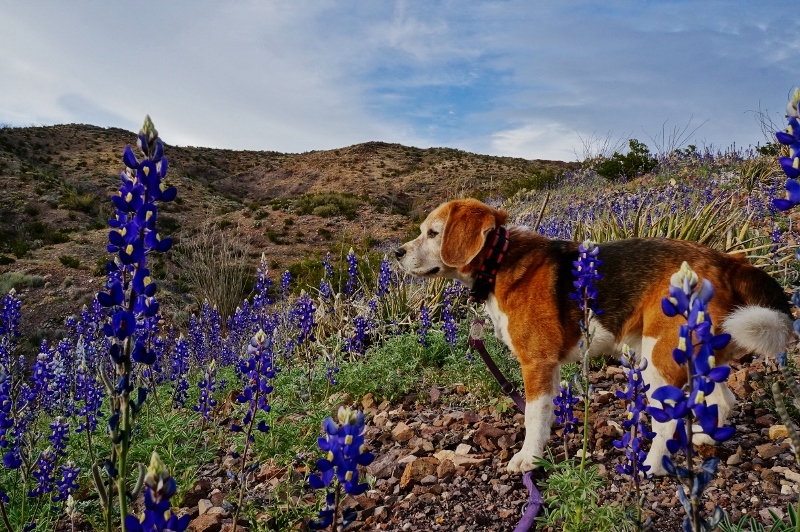 Big Bend Ranch State Park is located a little further west of its more well-known and visited cousin Big Bend National Park. 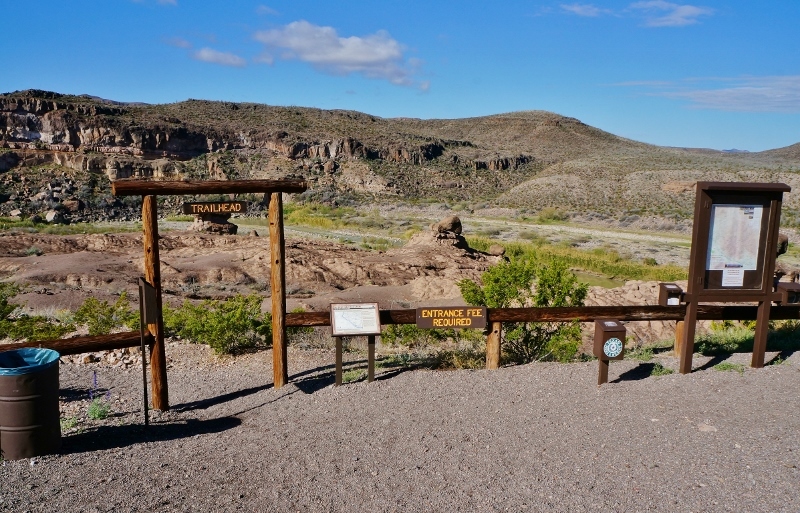 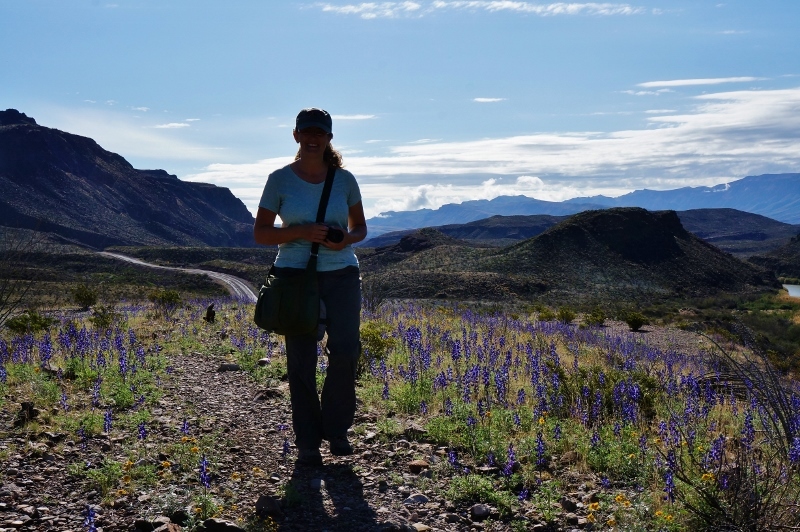 During our spring 2012 visit to Big Bend NP we had day tripped over to this state park. 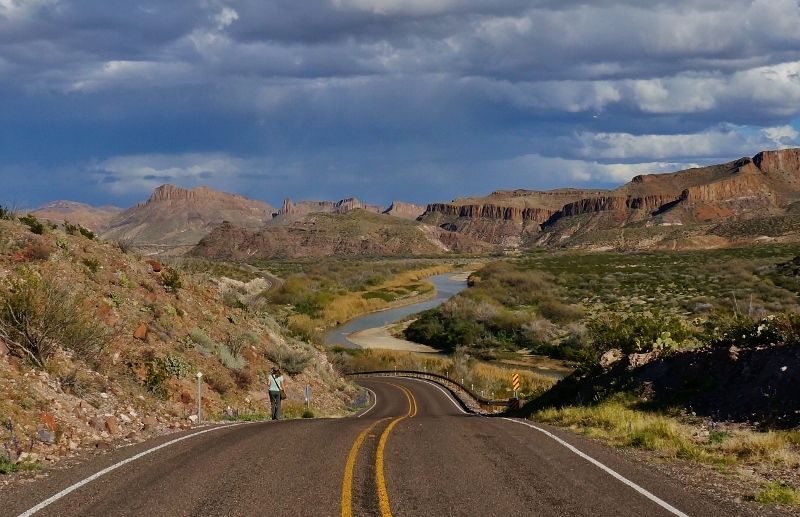 We were blown away by the amazing scenery as we drove the highway through the park along the Rio Grande. 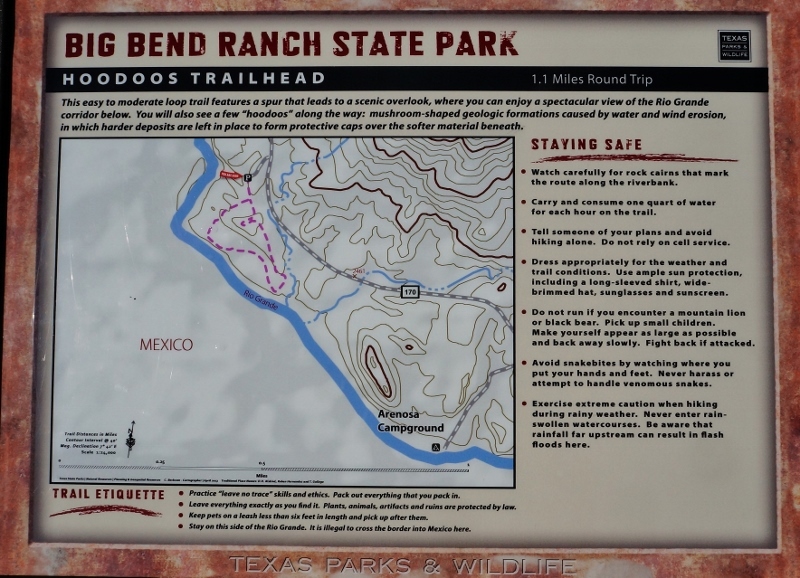 So, during this return trip to the area we just had to revisit Big Bend Ranch State Park and explore it in more depth. 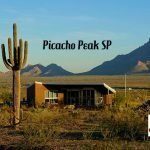 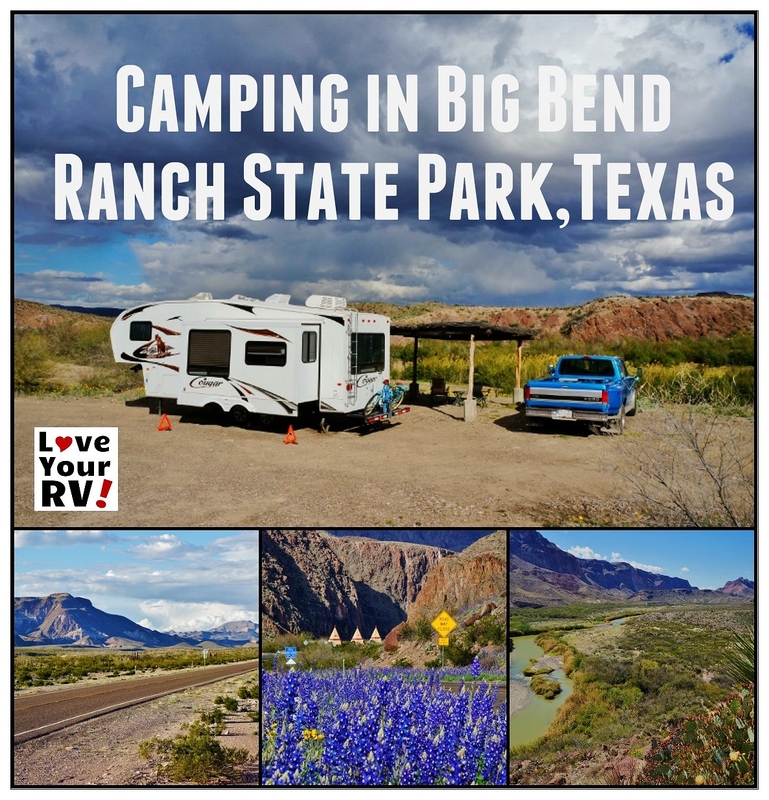 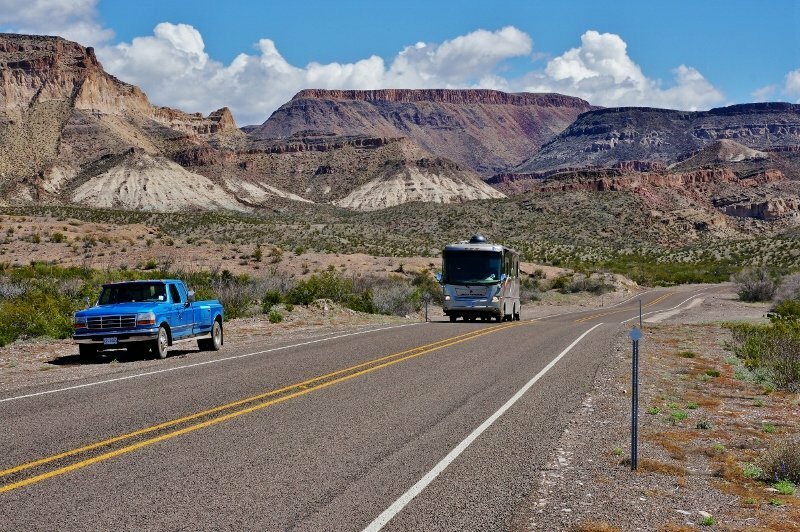 While staying at the nearby village of Lajitas, Texas in a really nice RV Park called Maverick Ranch we stopped in at the state park visitor center to check out the camping possibilities. 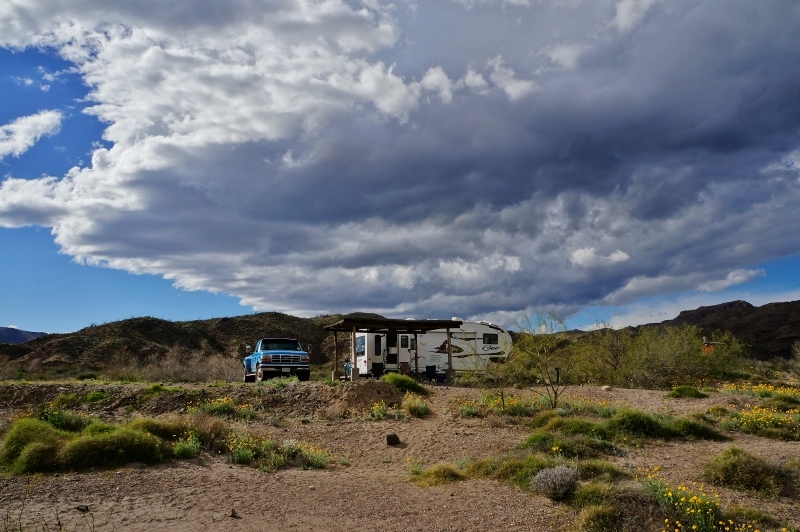 The choices for a rig our size were a little limited and the best bet was a campground called Grassy Banks. 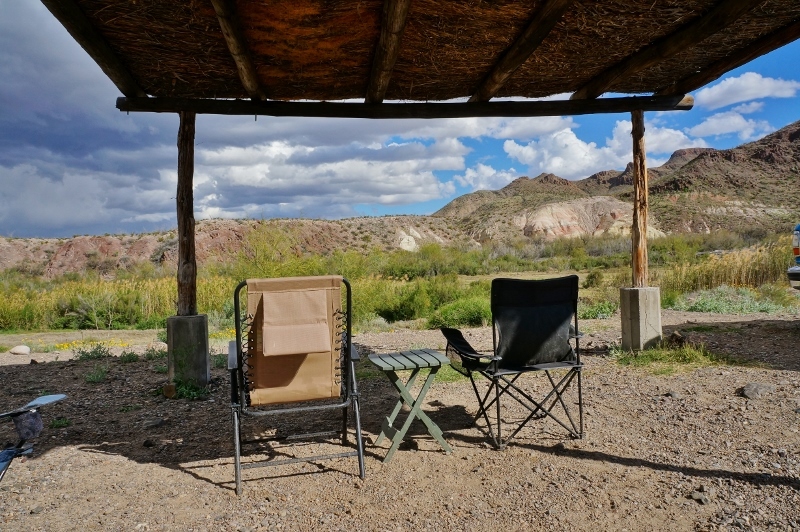 We took the truck only out for a scouting trip and found a site to our liking right on the Rio Grande; it even had a cool looking wood shelter. 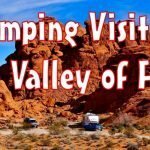 We dropped back into the visitor center and booked it. 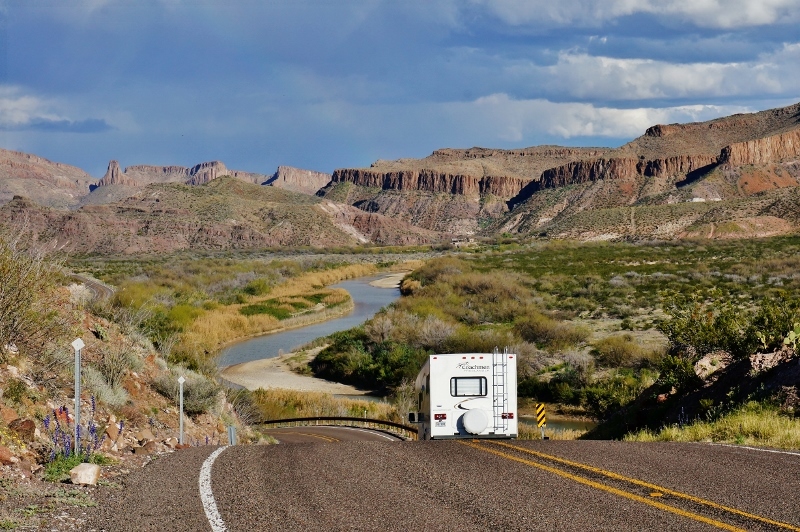 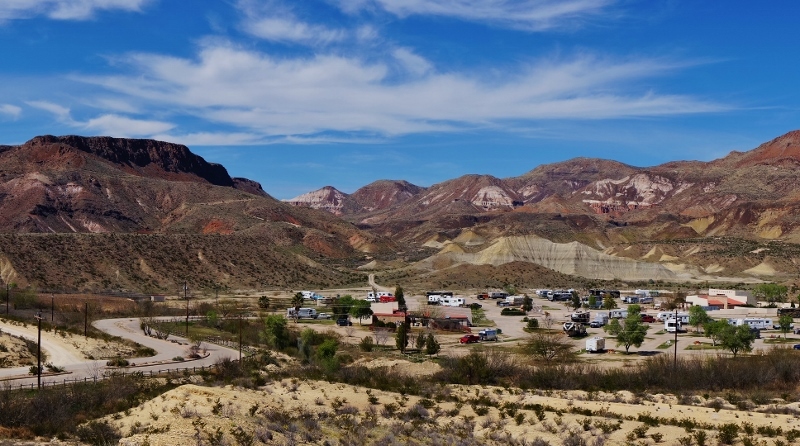 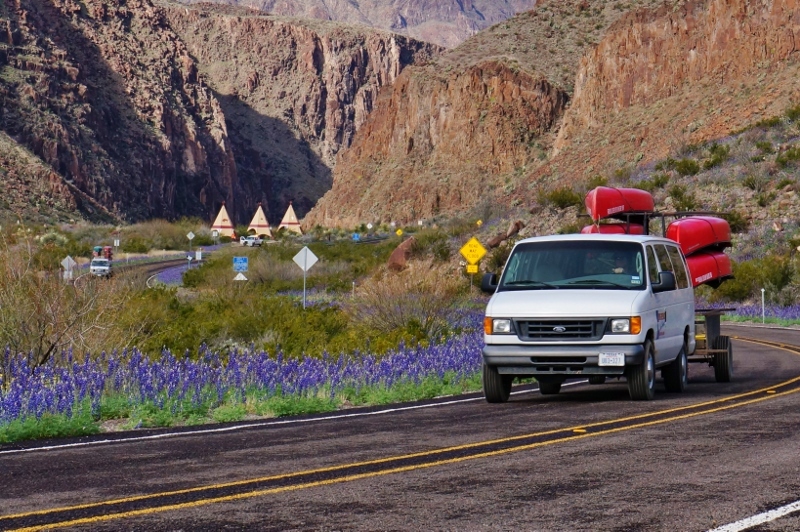 The camping sites at the Grassy Banks campground like the others in the Big Bend Ranch SP offer no hookups. 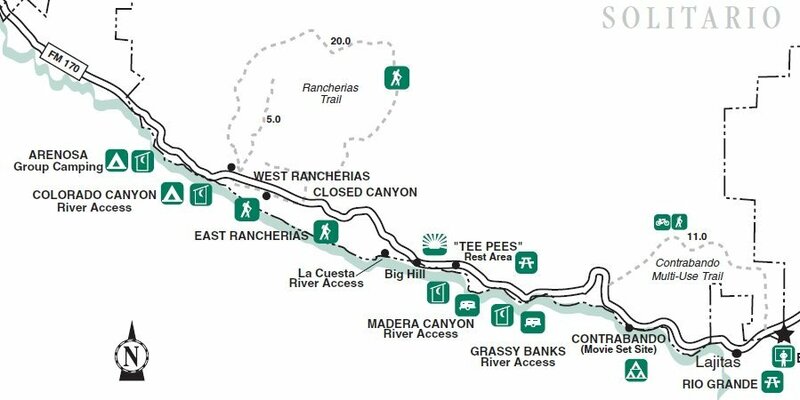 The only services are trash containers and a composting toilet. 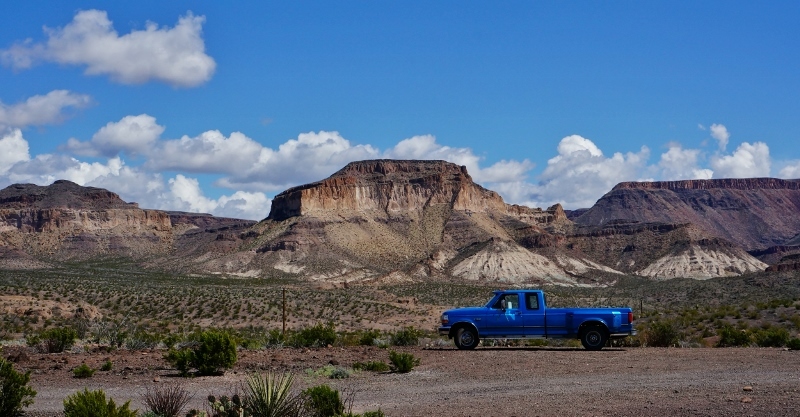 I did note a dump station in the visitor center’s parking lot. 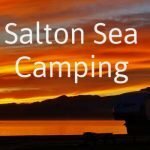 The fees were $12 dollars a night for camping and another $6 dollars a day for the state park entrance so we paid $18 dollars a night for a primitive campsite. 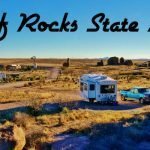 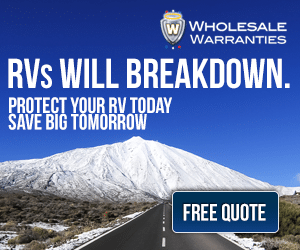 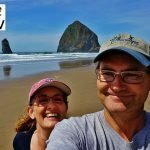 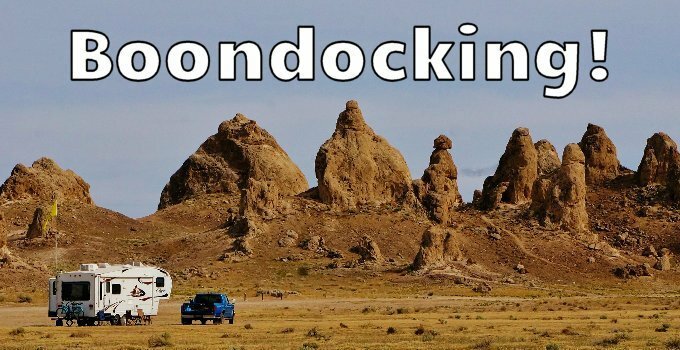 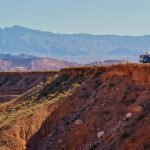 Normally a little on the pricey side for boondocking but the scenery was to die for! 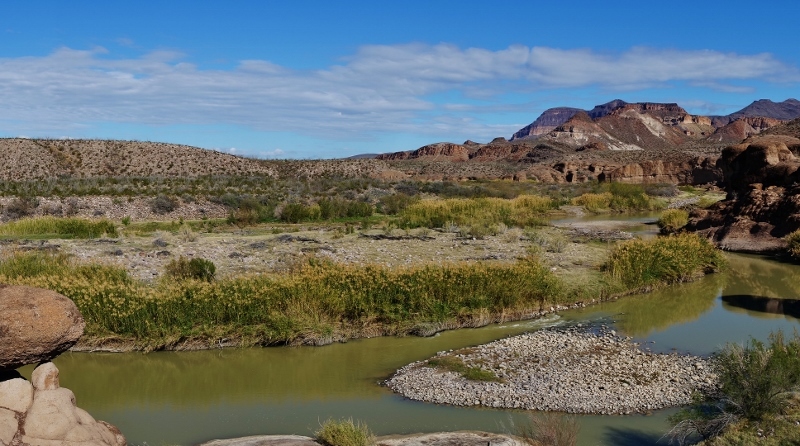 We were right on the banks of the Rio Grande looking over to Mexico and all around us was gorgeous mountain terrain. 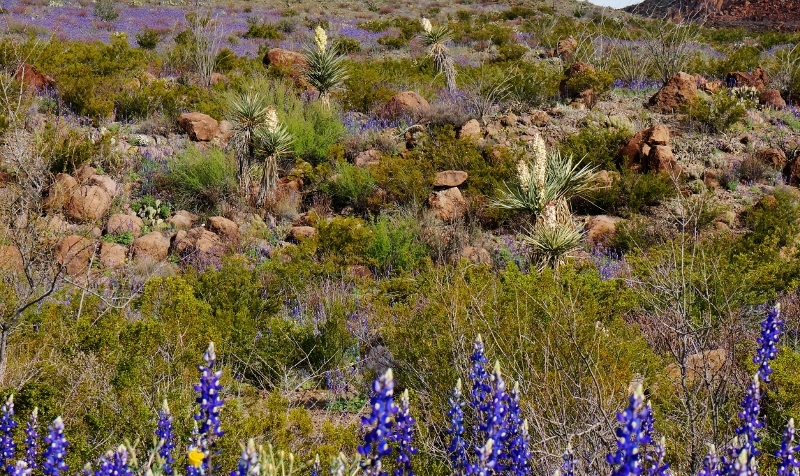 To top it all off we were visiting right as the spring wildflowers were starting to bloom and it was turning out to be a banner season for them. 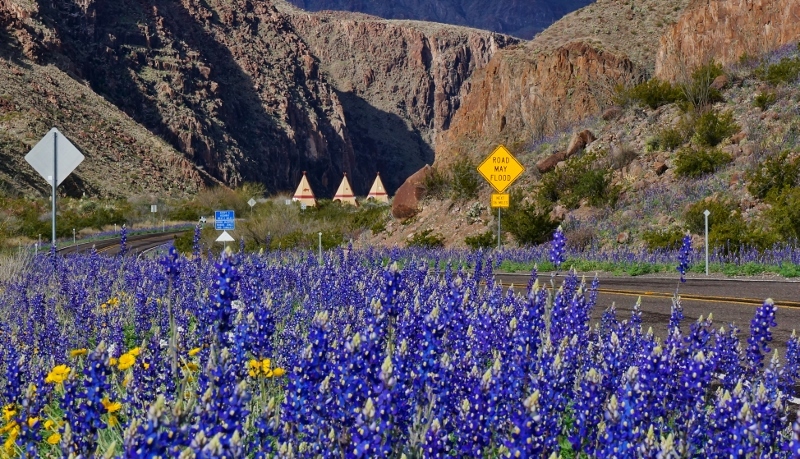 Everywhere we looked things were budding up and blooming with the most abundant and striking being the Texas Blue Bonnets. 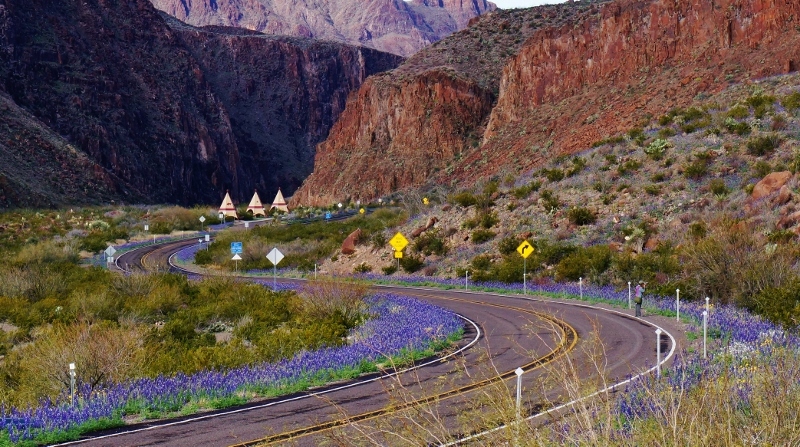 These bright blue flowers were all along the highway and carpeted many of the hillsides. 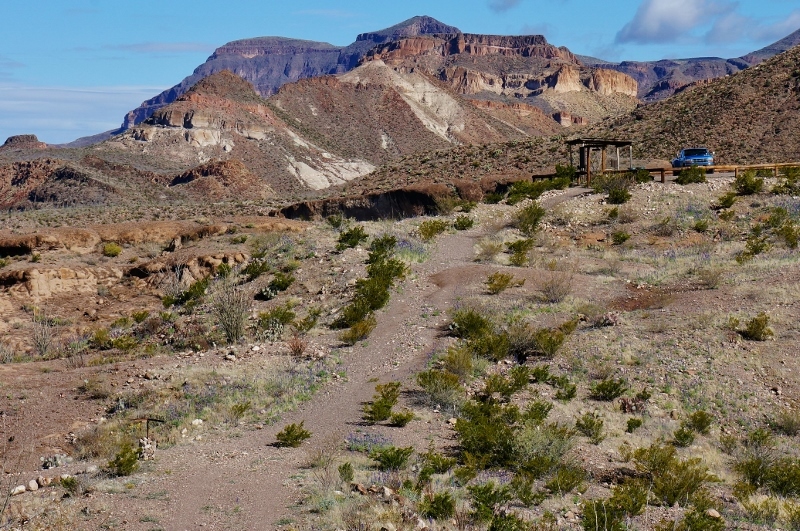 It was such a contrast to the normal drab desert coloring. 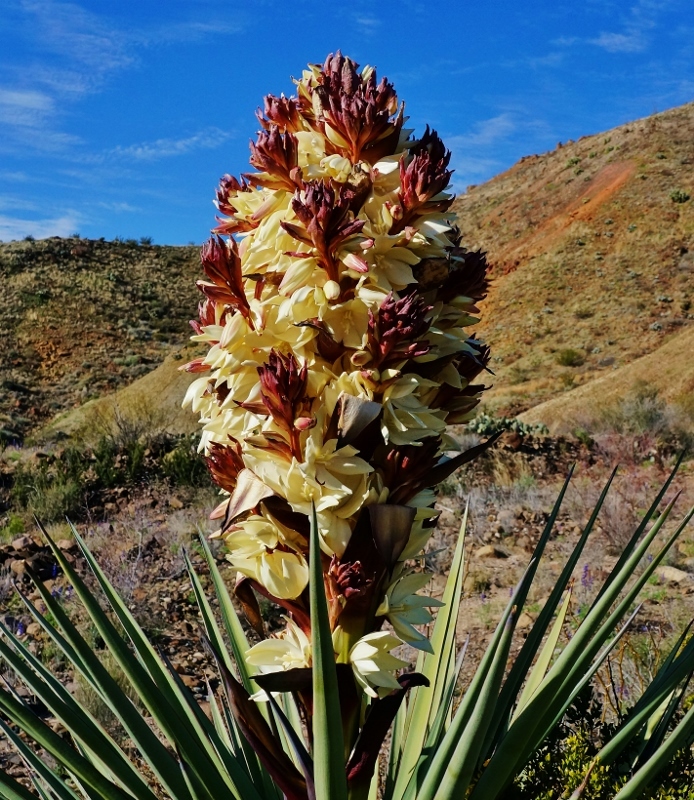 Another plant in full bloom with its massive yellowish maroon flower was the Yucca. 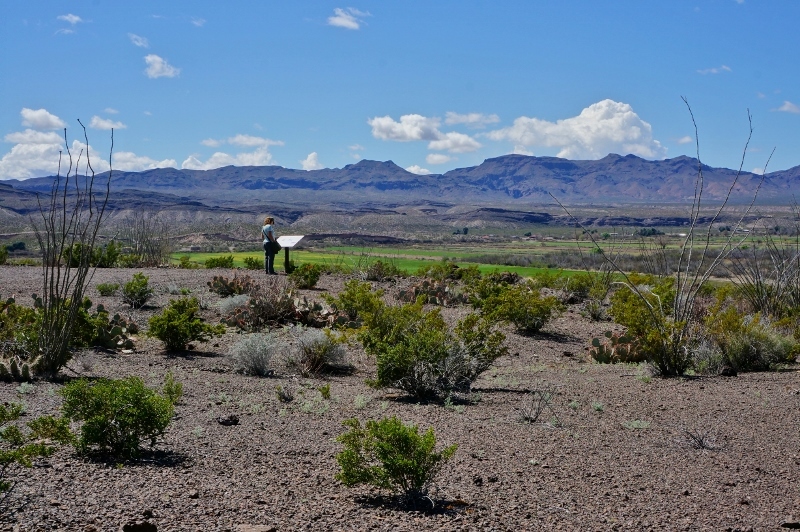 They dotted the landscape all over. 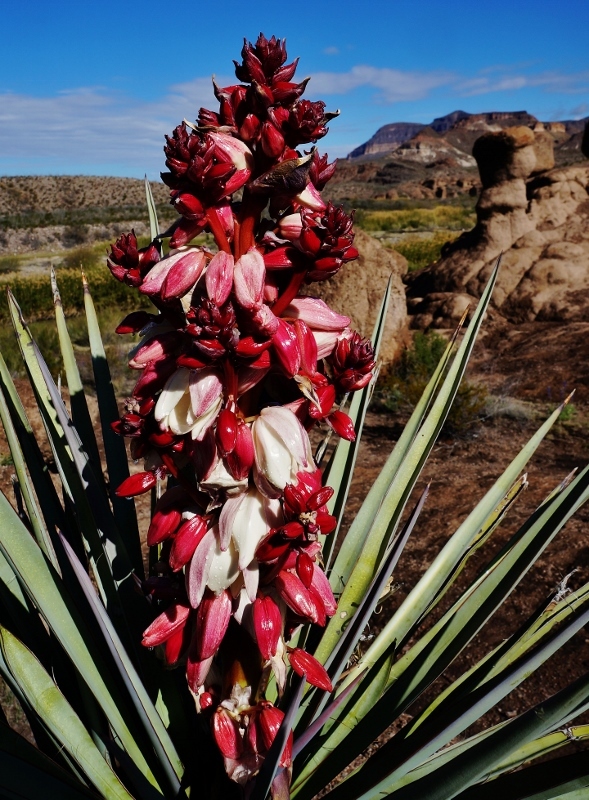 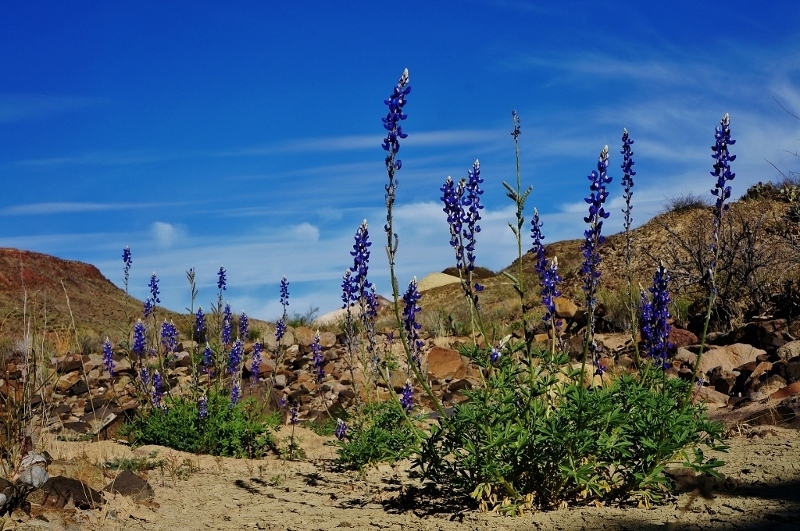 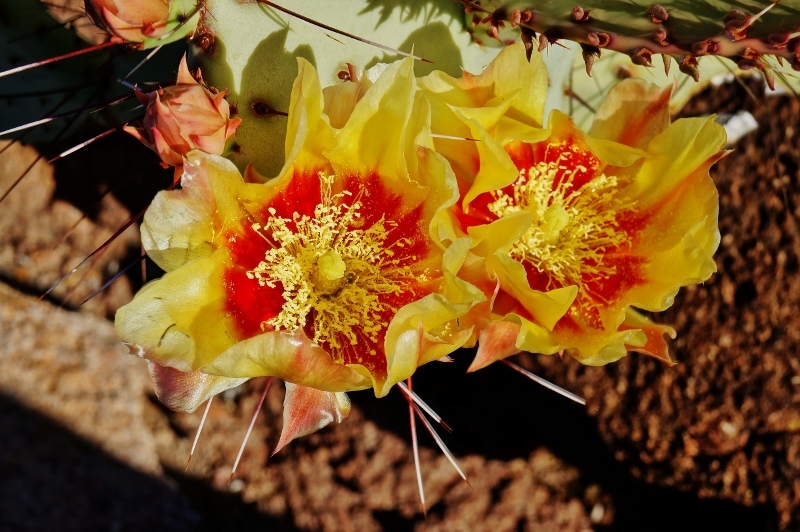 In all our desert travels, I’ve never seen so many in bloom and with such magnificent flowers. 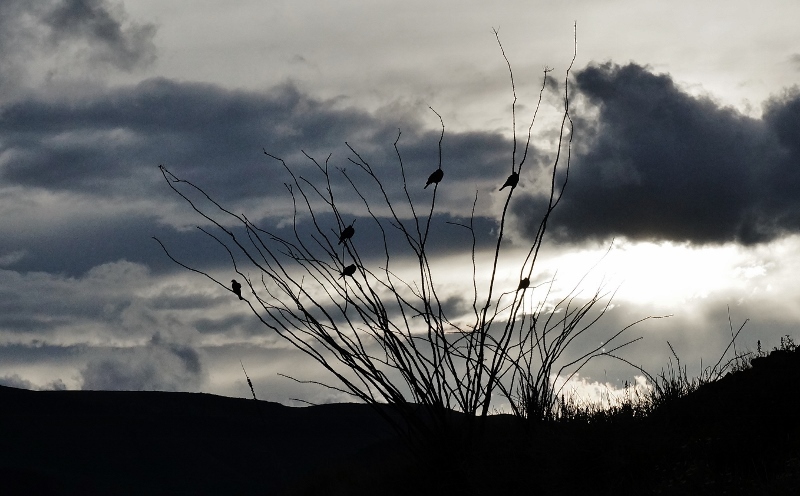 The weather was a real mixed bag during our early March visit. 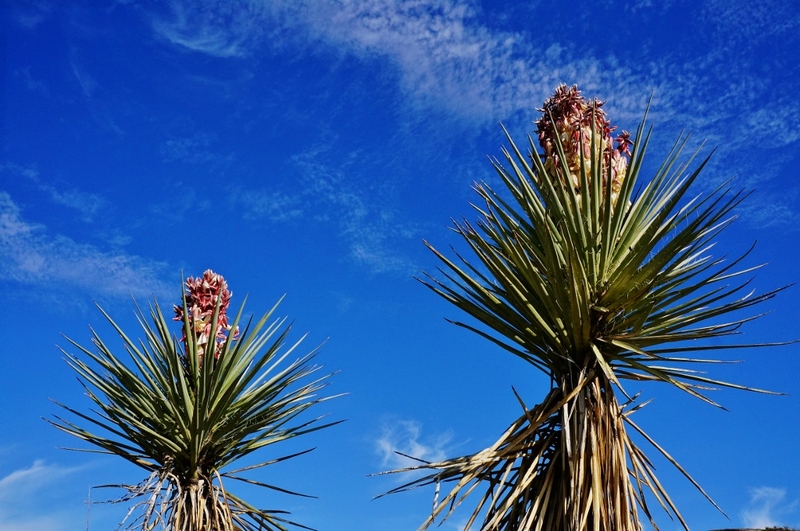 Some days the temps would barely crack 50F and others it would get above 80F. 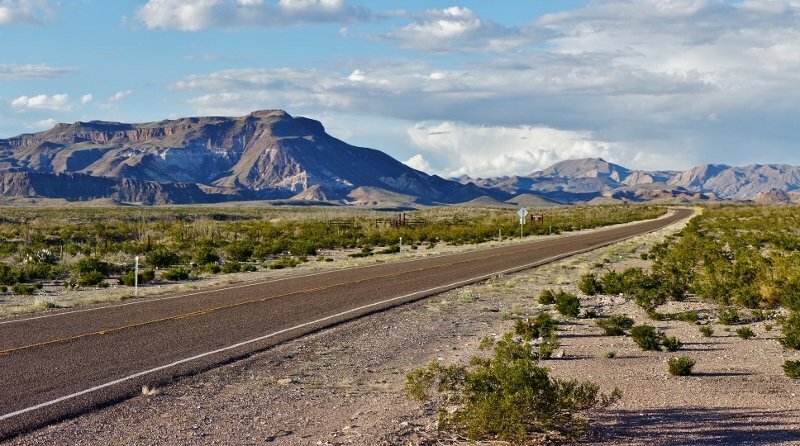 Seems there was a very cold air mass over most of Texas and sometimes it would push down into the Big Bend area. 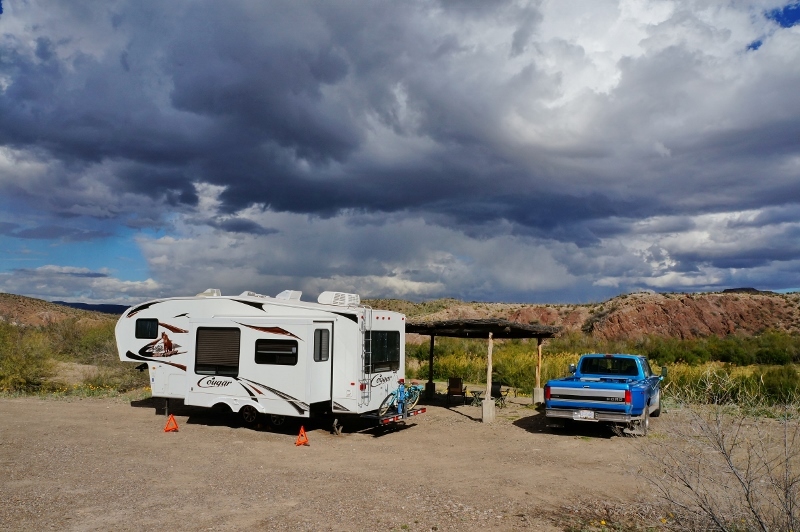 While camped in the Grassy Banks a big thunderstorm came through and we were rewarded with a gorgeous sky and even a rainbow! 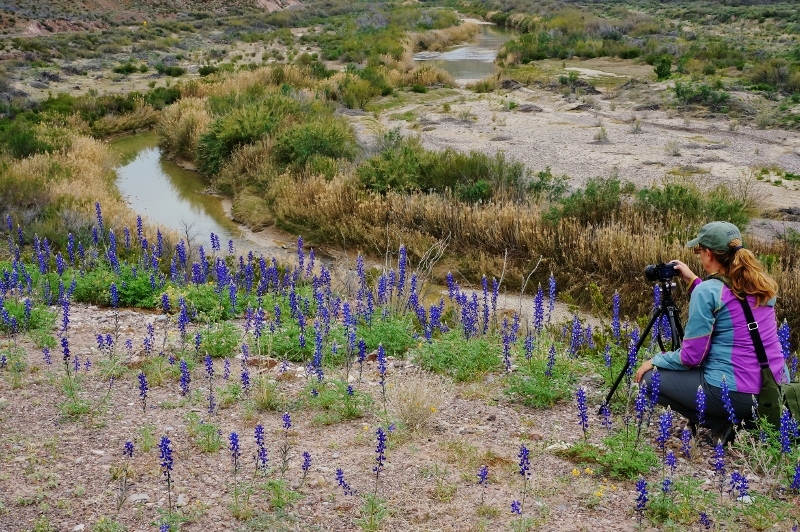 The next day as it cleared out the clear blue skies filled with big puffy white clouds, a photographers dream, we spent the whole day driving along the famed Texas Highway 170 hiking and snapping our cameras. 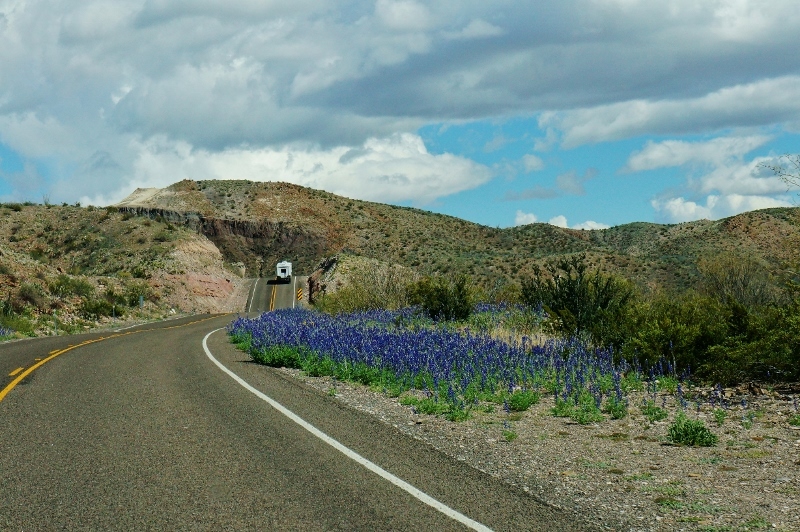 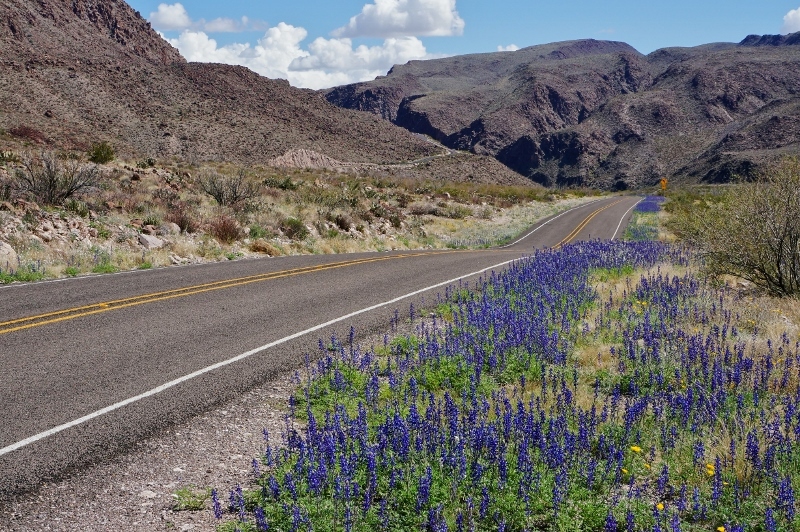 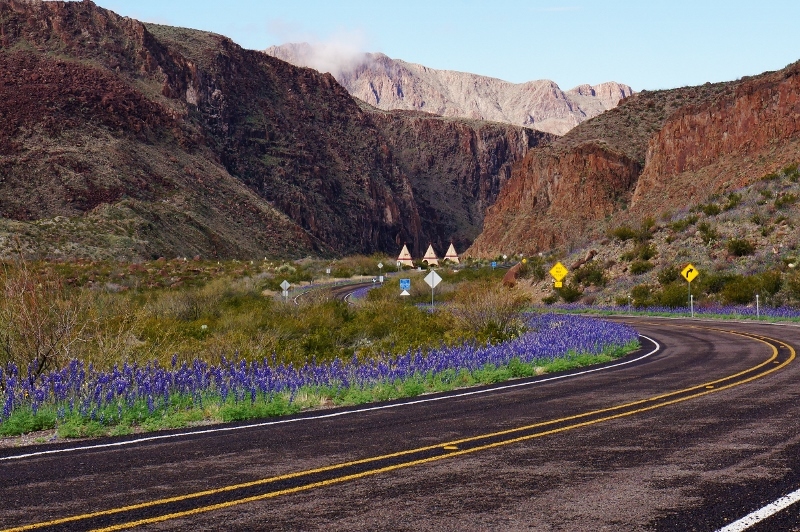 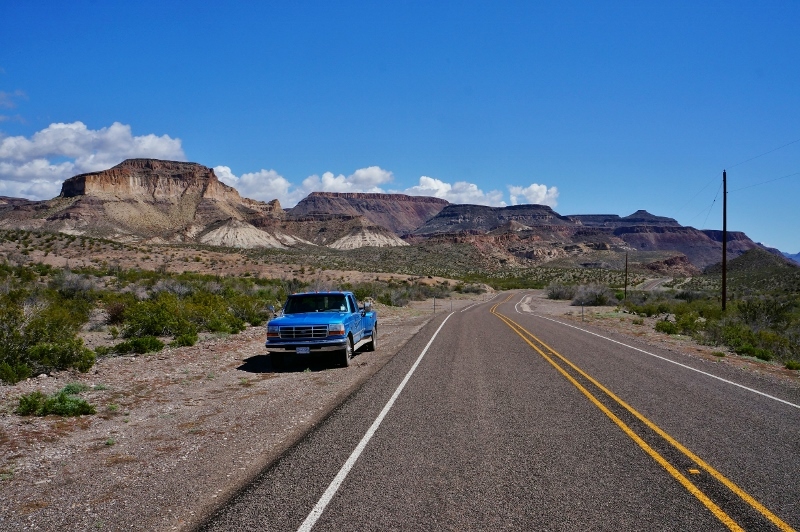 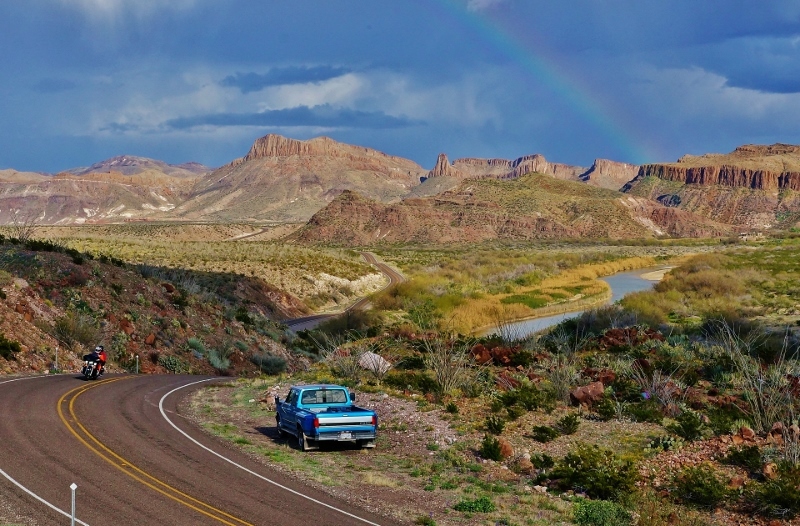 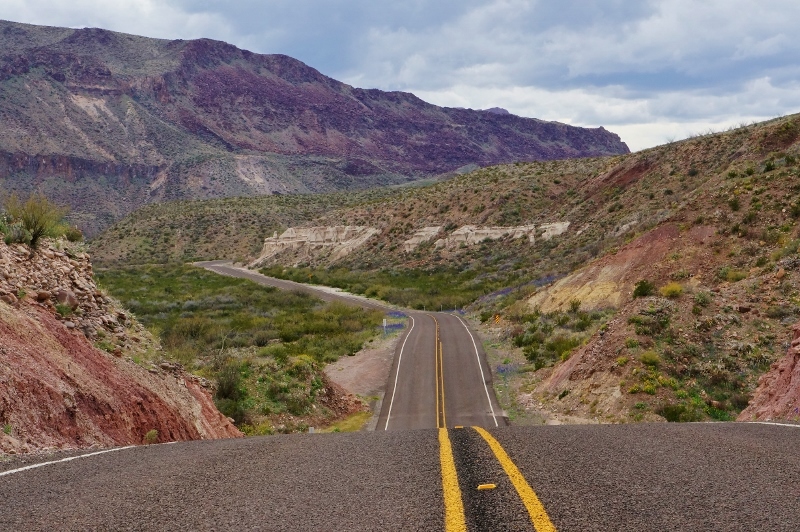 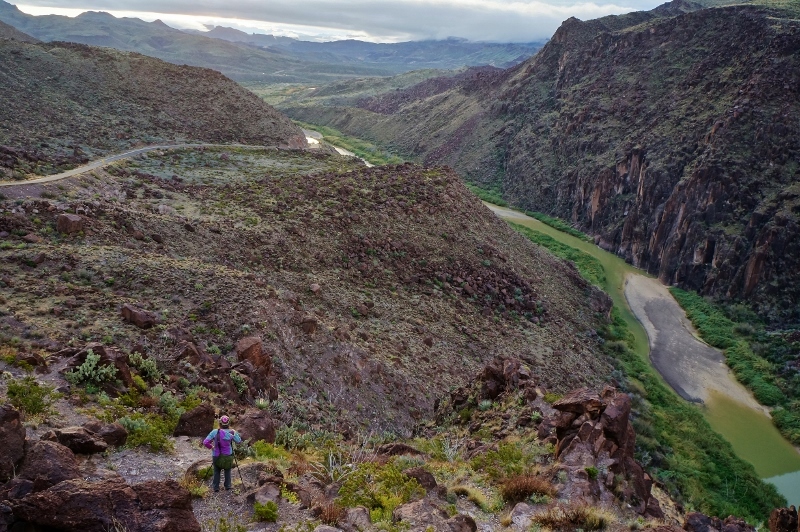 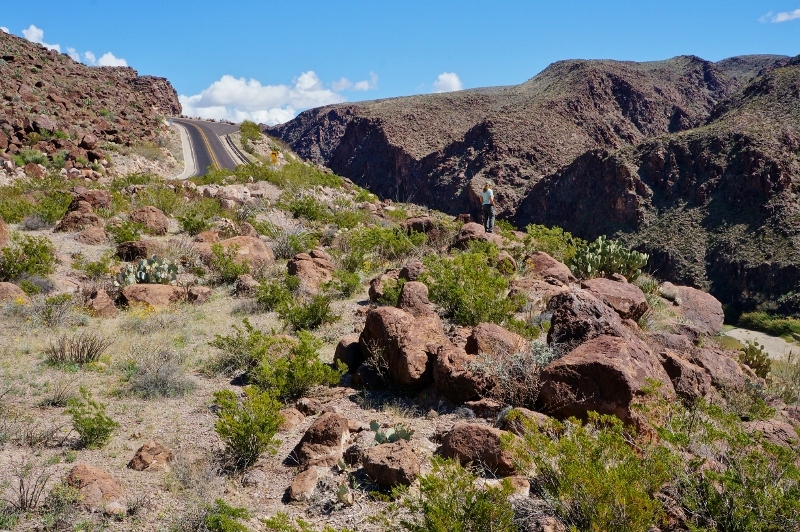 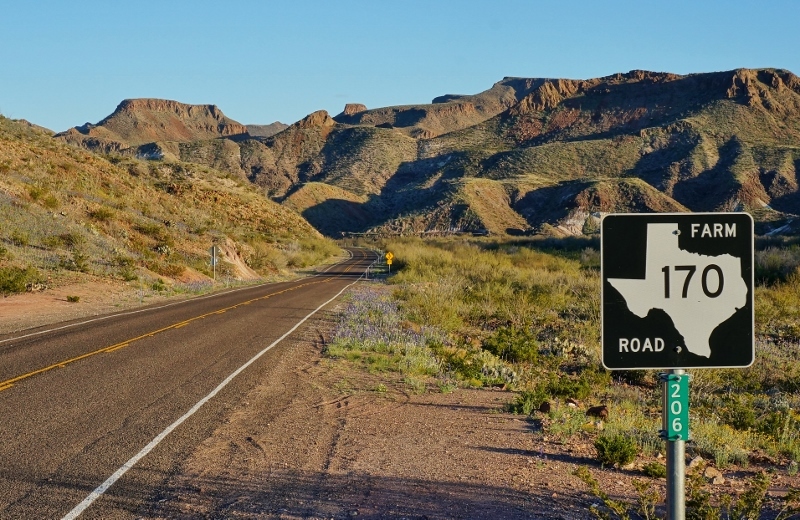 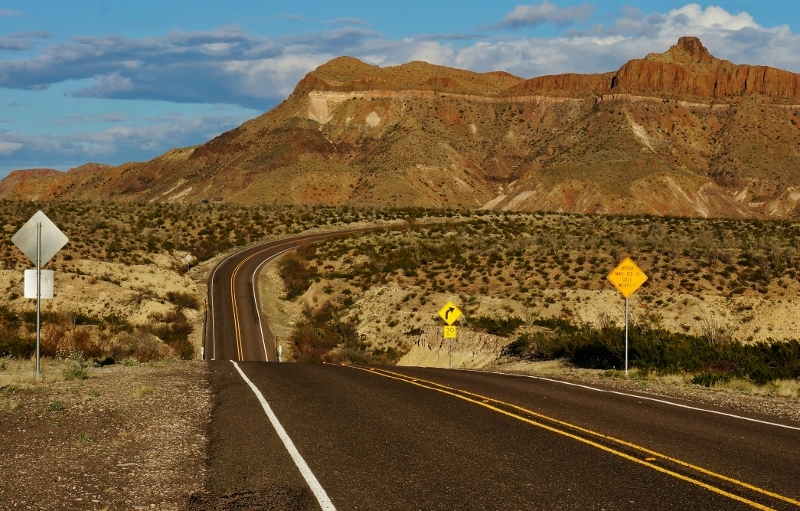 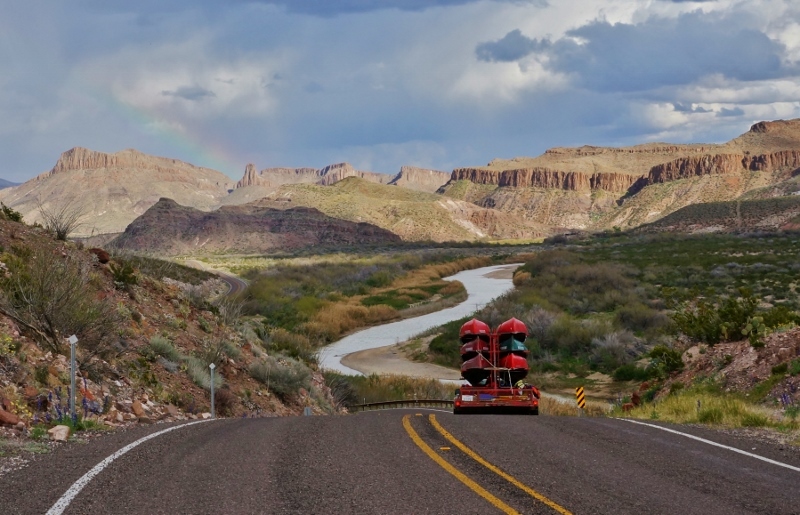 The highway 170 drive through Big Bend Ranch State Park goes by several different names but is commonly called the River Road. 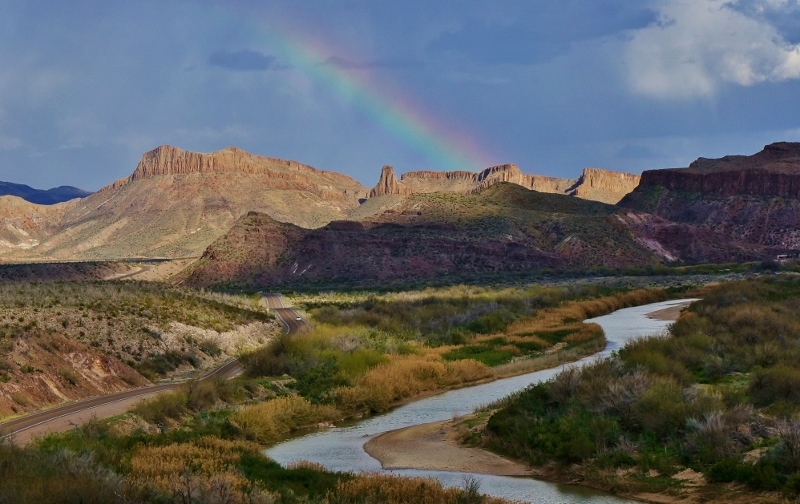 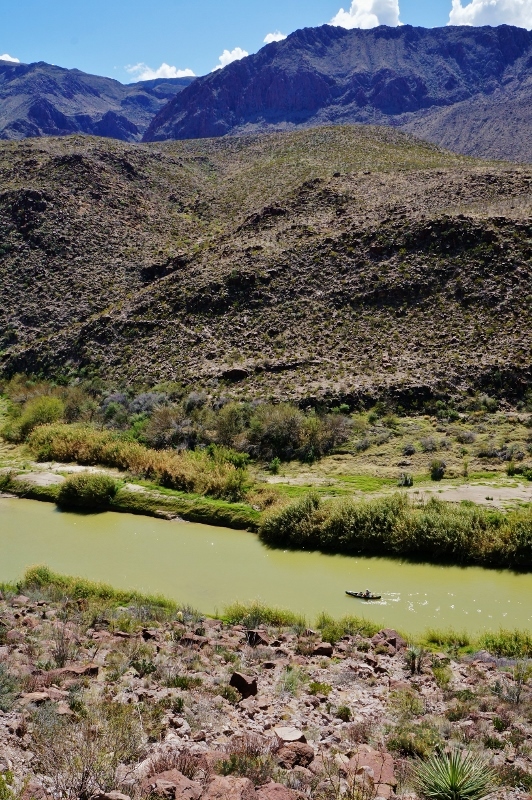 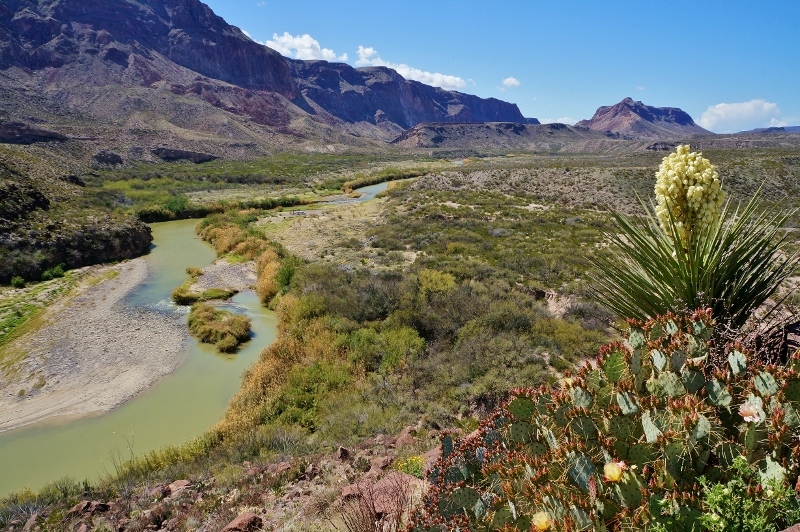 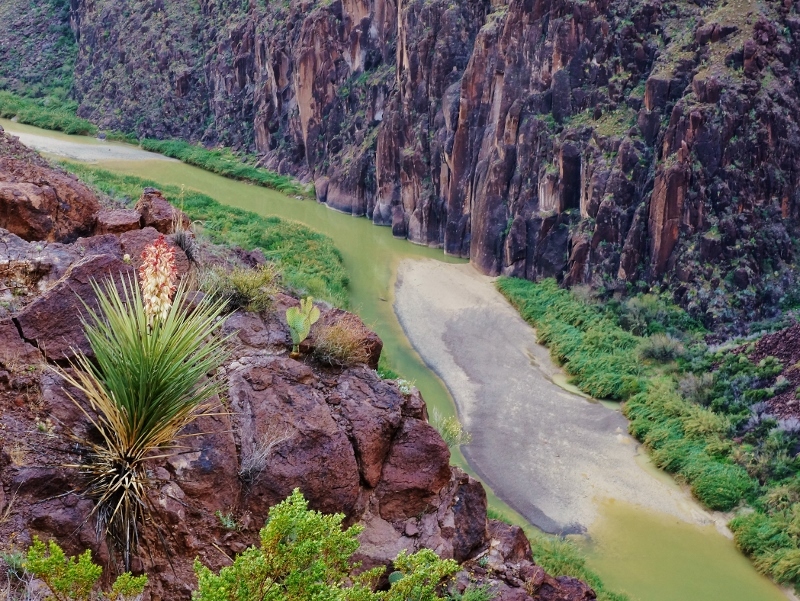 It follows the Rio Grande which splits the USA and Mexico in west Texas and has some of the most spectacular rugged mountain scenery I have ever seen. 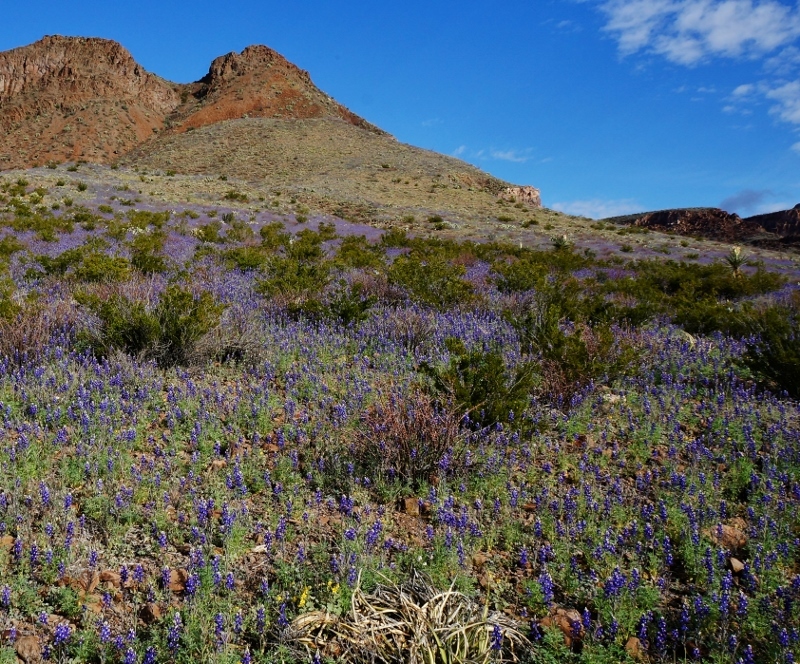 Add to that the spring wildflowers and a beautiful sky and we were in heaven. 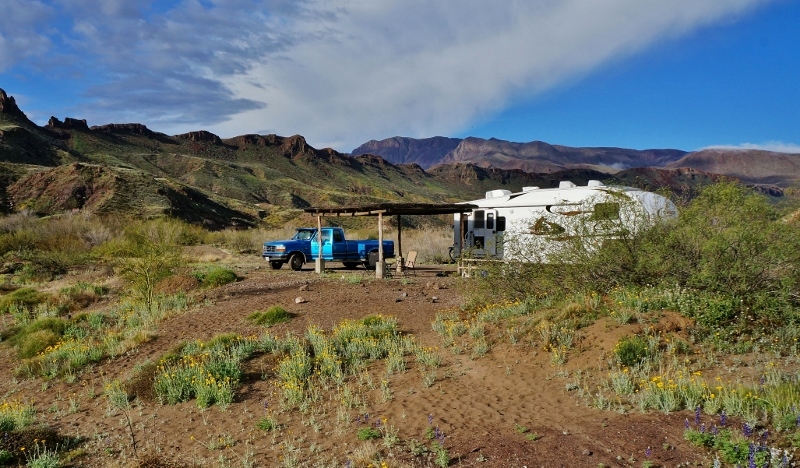 All along the way are pullouts to stop and take in the grandeur and hiking trails to let you venture into the desert landscape a bit. 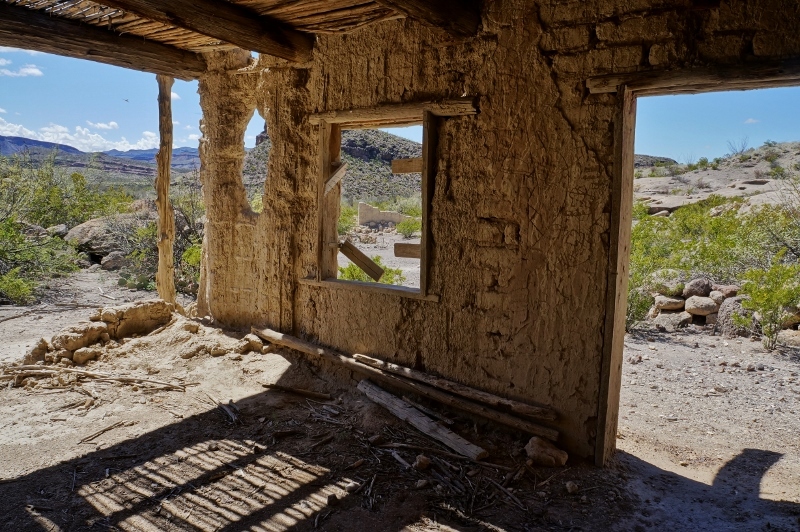 A few of the stops have abandon movie sets from old westerns. 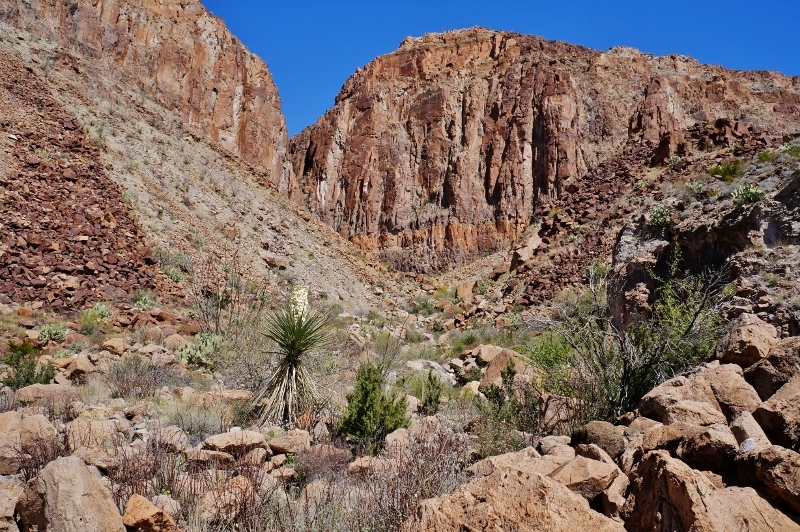 Others showcase the cool looking geology of the area. 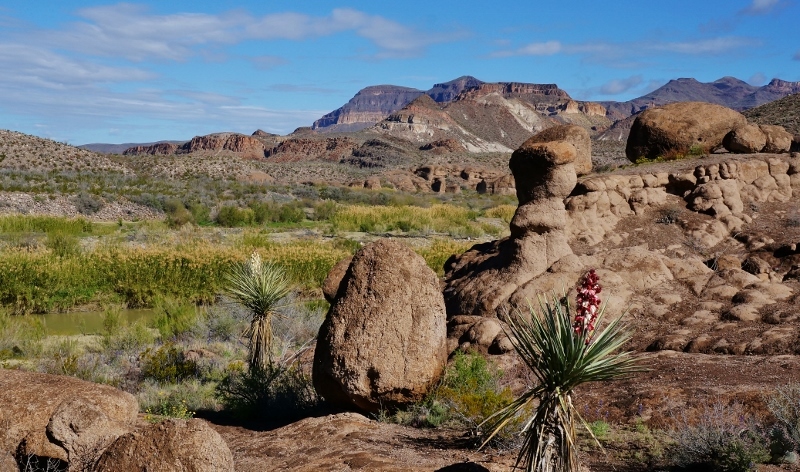 Big Bend National Park is spectacular but can get a little busy and crowded for my tastes, especially during spring break. 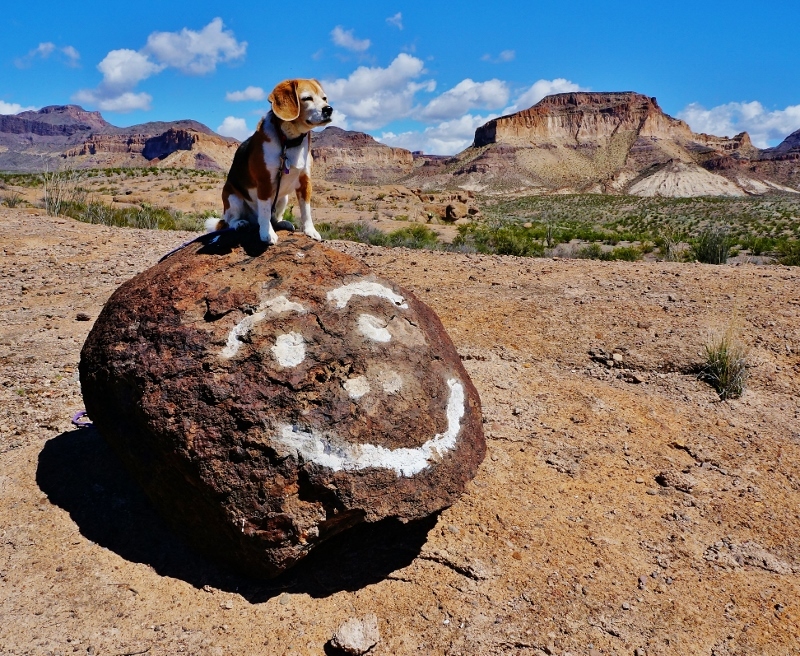 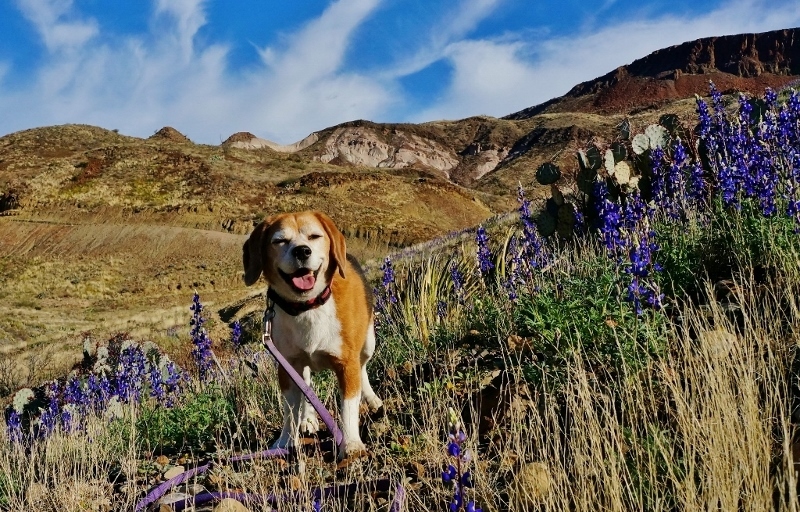 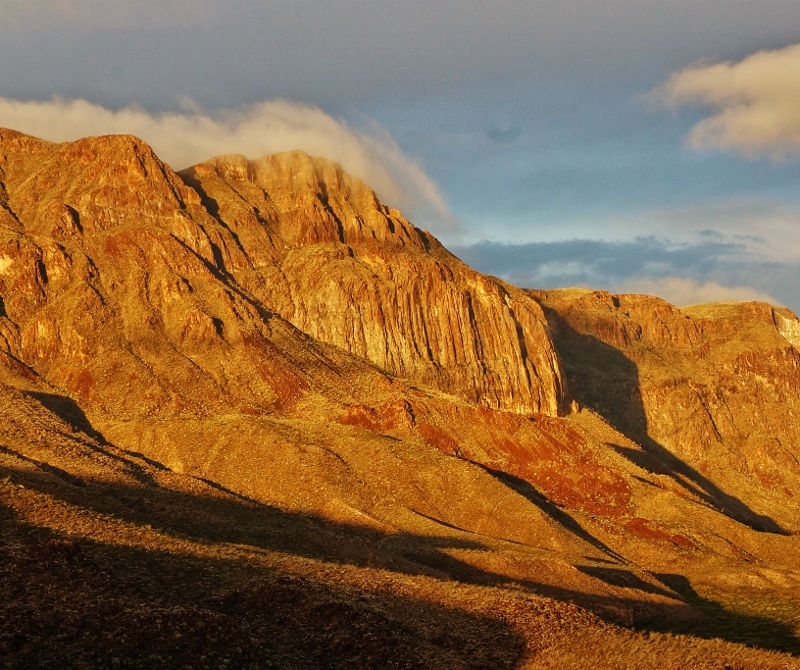 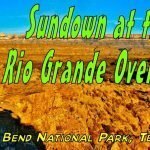 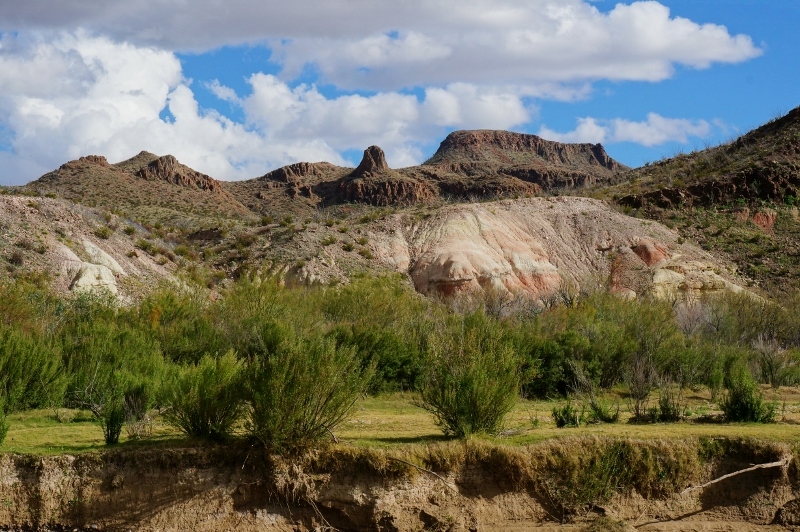 If you want to get truly off the beaten path and see much the same type of landscapes then I highly recommend a trip through Big Bend Ranch State park while visiting the area.